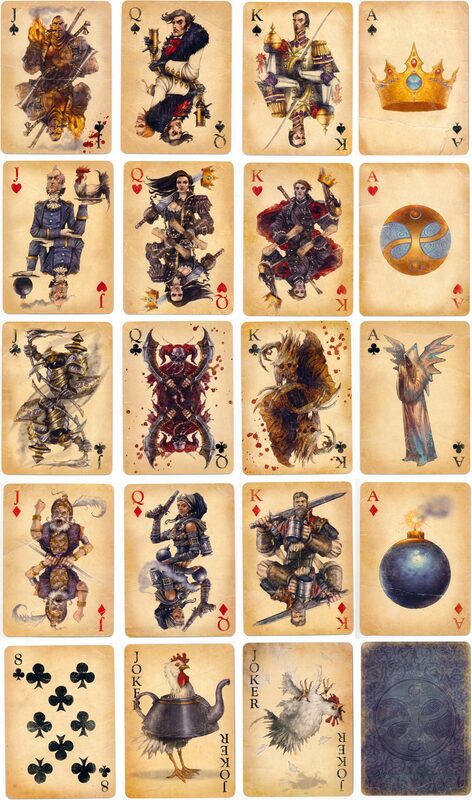 “Fable III” playing cards created by Lionhead Studios depicting characters in the role-playing video game published by Microsoft Game Studios in 2010. The story focuses on the player character's struggle to overthrow the King of Albion by forming alliances and building support for a revolution. The cards are completely original. Each ace, court card and joker features an image connected with the game. The pip cards are plain. The cards have been printed to look play-worn and aged, but are actually high quality cards with a 'linen finish'. All in all, a very lovely quality deck. 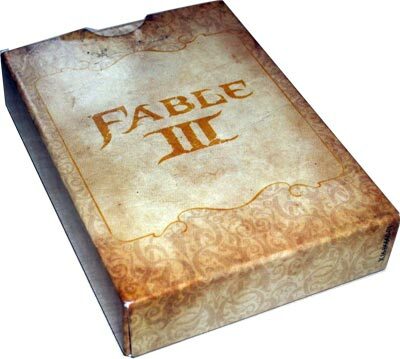 Above: “Fable III” playing cards created by Lionhead Studios depicting characters in the latest instalment of the Xbox 360 video game published by Microsoft in 2010. Decks were included as part of the Xbox 360 game package. Images courtesy Matt Probert.